I found myself bursting at the seams with simultaneous nostalgia, zeal and cinematic affection during Jon Favreau’s The Jungle Book, a film which feels so instantaneously classic and modern that to describe its appeal is somewhat difficult to accurately nail on the head. To imbibe its narrative is akin to an Old Fashioned served straight up, with a hefty serving of meat-and-potatoes style three-act structure. However, on an aesthetic level, it’s as if your visual taste buds have never quite encountered these mechanical familiarities before—seen this way, felt this way, experienced this way. I often loathe the term “experience” in regards to big-screen spectacles and 3D gimmicks, as it often deteriorates the true art of cinema, yet The Jungle Book utilizes experience in an effortless blend with what makes film-going so grand and magical. Its orchestrations work like a composer crafting classical music in a way that makes people feel like they’re hearing it for the very first time. Those familiar with Rudyard Kipling’s books and the 1967 animated Walt Disney film know the story. Mowgli, a “man cub” raised by wolves, must reluctantly leave the family he’s come to know and return to the “man village” after his life is threatened by the man-hungry tiger Shere Khan. Venturing off into the jungle with his panther guardian, Bagheera, and later encountering the blithe bear Balloo, Mowgli learns life lessons and how to face his fears through adventure, danger, and everything in between. And for those unfamiliar, I envy you as Favreau’s film is one hell of a way to be initiated. 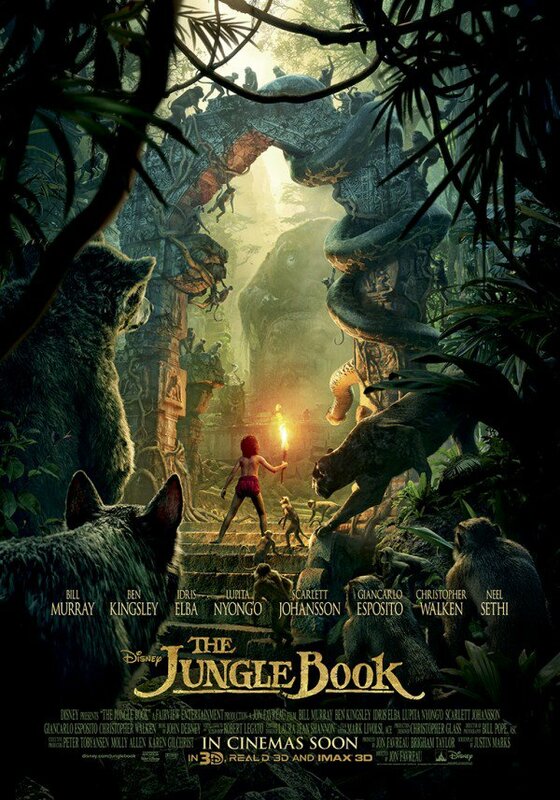 And I really can’t imagine a better Jungle Book than what Favreau has given us. Everything just feels right. Using the latest moviemaking technology, the fabricated world feels overwhelmingly authentic—the ground, the sky, and everything in between is wonderful and immersive, and while I’ll always choose 2D over 3D because I’m a fan of colors, the third dimension admittedly accomplishes great feats in adding depth to this richly-designed world. And the characters within make this a world worth getting lost in. Newcomer Neel Sethi makes for an inquisitive, affable and stirring Mowgli, holding in his own in an atmosphere where realistically he is the only warm body on screen. However, the digitally rendered talking animals of the film creates wonders to behold, and the voice casting is among some of the most impeccable I’ve ever seen. Scarlett Johansson’s transfixing voice fits seamlessly with hypnotic serpent, Kaa. Sir Ben Kingsley makes for a noble Bagheera, and Idris Elba voices a terrifying Shere Khan. The late Garry Shandling transforms into a bumbling porcupine, while Jon Favreau himself and also Sam Raimi show up in bit parts that momentarily turn the film into a fantastic screwball comedy. But the MVP undoubtedly is Bill Murray, who essentially just plays himself in bear form while voicing the carefree Balloo. Runner-up is Christopher Walken as King Louie, his unmatched vocal cadence brilliantly erupting with Walken-esque lines such as “I got ears. My ears got ears, kid” and engaging in the wonderful “Doo, doo, doo” melody of the film’s second most famous song after “Bare Necessities,” “I Wanna Be Like You.” I’ll also be damned if I see a better creative decision/cultural nod than the fact that Walken’s character is called to action by a cowbell. Overall, this is a trip worth taking. Molded with care and exploding with affection and adventure, this may be Favreau’s very best film to date in a career that has gone from Swingers to superheroes. Here, he finds his footing in a universal tale that anybody can relate to. I felt like a kid being told a bedtime story. At the same time, I also felt like an adult witnessing a spectacular film. Favreau draws out every part of us in the truest definition of movie magic, stripping down the bare necessities of narrative then building it back up into something that shines, stirs and will unquestionably stand the test of time. Eagle Tribune, Sound & Picture Magazine and Forces of Geek.